We’d be forgiven for thinking that fashion and style are all about our shapes and our various body parts. This is the message we get from television, movies, Instagram, and some style experts. 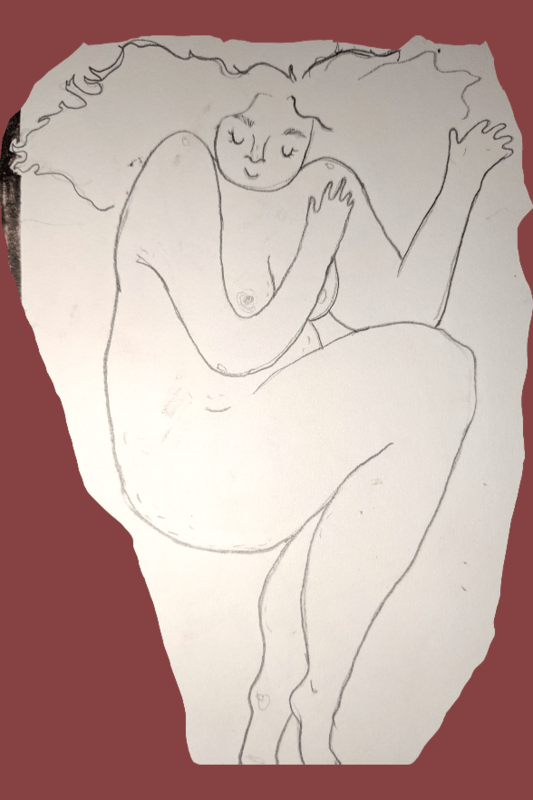 We’re told to “get the illusion of slim hips” or to “look taller and leaner,” or “lengthen our necks.”Please don’t get upset with me because I have a body shape that’s been culturally “in” for several decades: slim, with a modified hourglass figure. I don’t struggle to find clothes that fit me, and thrift shopping is easy at my size. That’s not the case for all of us over-40 women, though, and I want to shout out that whatever shape and size your parts are, you’re OK. You deserve to dress however you please and make your own style statement! 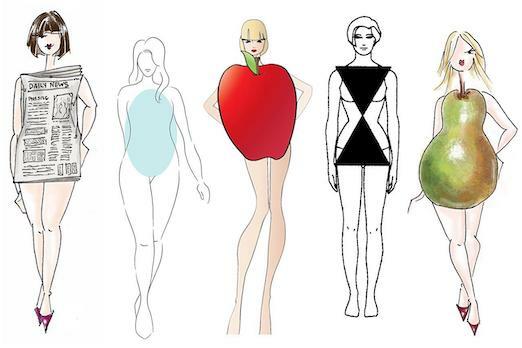 These illustrations are amusing and minimally helpful in determining our basic body shape, and this one makes me smile (I look like the Daily News!). But no matter which fruit shape we resemble, we can dress as we like. This is why I chafe at style “rules” that tell us how to “balance” our figures. I am not a big fan of rules at any rate, (you knew that already ) when it comes to dressing ourselves. I especially don’t like being told to elongate my torso, slim my ankles, or do something equally impossible, when I could be drinking a latte or watching Project Runway (miss you, Tim Gunn). I love this. Check out more of Kiara’s art at her Instagram page. So how do we manifest this contentment with our bodies? Play and experiment as you come up with looks for yourself. Don’t dwell on any body parts. Show your 50 year-old arms any way you like – there is nothing wrong with any age woman’s necks, legs, or hands. Or height, or curves. This is who we are and no style book will ever change that. Practice saying “My hands are fascinating – they have stories to tell.” “My hips are nicely rounded”, and “all the models in print and online are photo-shopped out of knees, elbows and necklines”. Use words that are neutral, if you can’t muster up a sincere compliment to your feet or belly. I think it’s a happier day when we just put on something we love, in our favorite color, and head out the door with joy. We can dress for our hearts rather than our other body parts. Are you feeling body positivity today? I read the blog Already Pretty for years and Sal used a term that I found respectful and that would preface information some but not all of her readers would find helpful: “your figure-flattery priorities” which recognizes that each of us probably have such AND that they may differ vastly from any “norm” and from each other and from decade to decade and so on. You can take in information that way without it being directive or normalized. Not everyone wants to minimize X or emphasize Y and so on. I completely agree. Like you, I also share what many would feel is an enviable figure. But I do not define myself by my shape. I define myself by what I do and not how I look. But I agree it is wonderful to be able to find so many great clothing items because we are small. I also really enjoyed her art and I think you for sharing it. I cherish the right to dress in whatever I like when I can. I exercise it to the full and have a blast doing it. Where does criticism end and bullying begin? It’s a fine line between us and them mentality. Celebrate the freedom and look away when it’s not our thing is what I say. Squeeze out as much joy as possible while we can. Hold the gravy. I think the issue here is one of ‘expressive dressing’ ……..that is, clothing oneself as an expression of self. Viewed from that perspective those choices are no different that any other way we present ourselves to the outside world….be it makeup, hairstyle, linguistic patterns, decorating choices etc etc. Personally I am comfortable in any permutation of neutrals and every once and a while will add something more colorful if I’m in the mood. If I am uncomfortable with how I look, it’s my option alone to reassess. And while I might find colors and ‘costuming’ psychologically demanding for myself I love to see people brave about both color and style. Obviously as with everything else we encounter in this world there is a range of response to the life choices of others from acceptance to mean spirited criticism and everything in between. If you think about it we have absolutely no way of knowing what drives people’s life choices, including how they dress themselves. Finances? exuberance? acceptance of self? traumas? end of life playfulness? Honestly, what’s to be gained by ugly thoughts…..what’s the point. Now more than ever we need as much love, gratitude and acceptance as we can give each other. It’s hard to push back against the messages society gives women “of a certain age” – don’t bare your arms, cover your neck, don’t wear short skirts, etc. It’s especially hard when these type of comments come from women our own age. I was amused by IRETH’s statement that “Age carries a well-earned gravitas that I think should be honoured”. Most of the women I know who have the most fun with their clothes are all older than I am. I think I must have been off petting a cat or something when they were handing out the “gravitas”. IRETH I am pretty sure you have completely missed the point. In fact, this is exactly what we don’t need to hear. I feel effing fantastic about the way I look. Every day. I went through a long period of being over weight and when I would look in the mirror and start hearing my critical thoughts, I would lean over and plant a kiss on my shoulder or arm or hand, look into my eyes in the mirror and say, “Cee, I love you!” I lost the weight, now look like an “average” size 10-12, wear what delights me and makes me feel good and have acknowledged that what is special and amazing about me is not my weight, height or clothing size. It is who I am, how I treat others and how loving and respectful I am to myself. Sounds glib? It was a long road to get to the place where I could write that and mean it. I think people should dress the way they want at any age or shape. No need to police other’s fashion choices or project attributes about their personality based on their style. Love the artwork. I read somewhere about body-positive clothing rules for school. Kids were showing up in inappropriate clothes. The clothing rules were: have to be able to run and play, no constant pulling to get clothes back in place. I think similar rules apply to adults–if something is too tight and restricts movement, you need to think twice. At the very least, it isn’t elegant to constantly readjust clothes. I don’t agree with Ireth at all. Everyone at every age and weight for that matter should be allowed to freely wear whatever makes them happy. If you don’t care for it, don’t look. It’s simple. Live and let live I say and I like the idea of dressing for our heart. I heartily agree with your comment, Suzanne! I don’t completely agree. I’m 68. I’m quite thin and athletic. I can wear really any type of clothes, but I avoid wearing sleeveless shirts and never wear shorts or short skirts. Skin ages and muscle tone ages, despite exercise, and I have no desire to look 25. A long time ago, I saw a tall, thin 80-something woman in a shop. She was wearing short-shorts! She looked ridiculous. An obese woman in shorts? There is nothing appealing or classy about that! Age carries a well-earned gravitas that I think should be honored. One can dress in a lovely and and cool and fashionable way, but one must still respect one’s age and dress according to one’s dress size–I refer back to the 80-year-old in hot pants and an overweight 60-year-old in shorts. Why must Baby Boomers insist on being “forever young”? Thank you and have a great day! I do agree with Ireth. At an older age, for most of us, our skin loses elasticity, despite exercise. At 66, I am getting away from sleeveless styles and that is my choice….and it makes ME happy. There are plenty of options that are flattering to older skin. This is no criticism towards those who wish to dress differently. Dress in any way that makes you happy.